It has been a while I must say, but I haven’t been idle. I wanted a little bit more from my blogging platform, so I decided to move the blog to a new, self-hosted home – http://www.quintuitive.com. See you there! 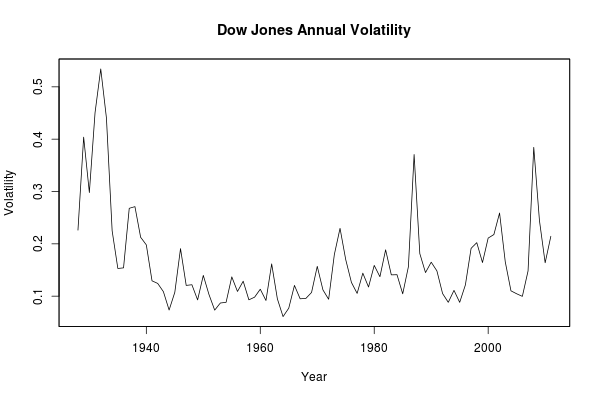 Were markets exceptionally volatile in 2011? That’s right, an owner of a crystal ball would have been able to multiply his money 10-fold in 2011 alone! For further comparison, in 1932, the owner of the same ball would have been able to multiply his money … 590 times! A close on the SPY of above $124.46 (which is -0.65% from the yesterday’s close) will signal a short position according to the DVI indicator, which has been exceptionally successful in predicting the SPY this year (which means nothing of course:)). It is interesting to note that a close above $126.10 will be above the 200-day moving average. Something unseen since Dec 7th, and the last time this (SPY closing above its 200 day SMA) happened for more than 3 days in a row, was back in August. In any case, happy trading and merry holidays! How is typically ARMA trading simulated? The data is split into two sets. The first set is used for model estimation, an in-sample testing. Once the model parameters are determined, the model performance is tested and evaluated using the second set, the out-of-sample forecasting. The first set is usually a few times larger than the second and spans four or more years of data (1000+ trading days). I wanted to be able to repeat the first step once in a while (weekly, monthly, etc) and to use the determined parameters for forecasts until the next calibration. Now, it’s easier to see why I classified my earlier approach as an “extreme” – it does the model re-evaluation on a daily basis. In any case, I wanted to build a framework to test the more orthodox approach. To test such an approach, I needed to perform а “rolling” forecast (have mercy if that’s not the right term). Let’s assume we use weekly model calibration. Each Friday (or whatever the last day of the week is) we find the best model according to some criteria. At this point we can forecast one day ahead entirely based on previous data. Once the data for Monday arrives, we can forecast Tuesday, again entirely based on previous data, etc. My problem was that the package I am using, fGarch, doesn’t support rolling forecasts. So before attempting to implement this functionality, I decided to look around for other packages (thanks god I didn’t jump to coding). At first, my search led me to the forecast package. I was encouraged – it has exactly the forecast function I needed (in fact, it helped me figure out exactly what I need;)). The only problem – it supports only mean models, ARFIMA, no GARCH. Next I found the gem – the rugarch package. Not only it implements a few different GARCH models, but it also supports ARFIMA mean models! I found the documentation and examples quite easy to follow too, not to mention that there is an additional introduction. All in all – a superb job! Just a heads up that the DVI indicator will indicate a long position as of today’s close as long as the SPY closes below $127.17 (which is 2.38% higher than Monday’s close). The short has been in place since the close of December 1, for a negligible gain as of yesterday’s close. For more details how to pre-compute the DVI actions, see my previous post. An impressive performance by the DVI indicator! Let’s see how the year ends. Unless the markets close sharply higher, more than 5.13% on the S&P 500, the 20-week moving average will be above the close, thus, no changes to its out-of-market status. Likewise, the contrarian DVI indicator is also indicating a short as of the Friday’s close and so does my ARMA indicators for most of the values (a bit unstable today). Are the indicators foreseeing something we can’t grasp by our emotional thinking? Next week will tell. Today is the last trading day for the month and the markets are exploding, so are we close to the S&P 500 closing above its 10-month (or 12-month) moving average? The answer is negative. Unless the SPY (the most liquid S&P 500 ETF) closes at $128.81 or higher, we will still end November below the 10-month SMA. This is 7.23% higher than Thursday’s close. Not quite likely, but hey, put a LOC (limit order at the close) in your Interactive Brokers account. To compute these values, I use a parallel approach to the one shown for the DVI indicator. The code will be posted soon, but right now I am quite busy with some improvements on the ARMA/GARCH strategies. A very ugly week in the markets. The S&P 500 lost -3.69%, which put it below its 20-week moving average. The index was above this moving average since Oct 21, catching some of the October rally, but last week slammed this trade into losing territory, -1.61%. The market was down 4 of the 5 trading days. The DVI indicator was short on Monday (winning) and Tuesday (losing) and wend long afterwards (losing). This resulted in a lost of only -2.8%. The real loser was my ARMA indicator. Yes that’s right, it was even worst. It got the market direction wrong every single day of the week for a whopping -4.67% lost. Both DVI and ARMA are long for Monday (check the right bar on the blog) and they seem to indicate that markets are entering into oversold territory. I am dropping the 200-day moving average because it is hard to follow on weekly basis. The DVI indicator was long for the entire week, so it followed the performance of the index – 0.94%. As of the Friday close however the DVI indicator went above 0.5, which indicates a short position for Monday.